This page is dedicated to the plants of the cactus family, Cactaceae. With lots of pictures, locale information, authors, synonyms, and generic care tips. My goal is to build a unsable online cactus encyclopedia. Please apologize that this cactus encyclopedia cannot be complete because of the huge number of genera. I use the taxonomy of Curt Backeberg based on the book "Kakteen von A bis Z" by Walther Haage (1981). My thanks goes to the famous cactus nursery Kakteen-Haage in Erfurt, which allowed me to use plant descriptions from the book "Kakteen von A bis Z" by Walther Haage and images from their plants inventory on this homepage. Furthermore, I would like to thank the Botanical Garden of the University of Heidelberg, which that allowed the use of pictures from the collection of cacti by Werner Rauh. Thanks to all the cactus friends who helped me with their words and pictures. My special thanks to Immanuel Voigt and Edward Bartlett for correcting the English translation. 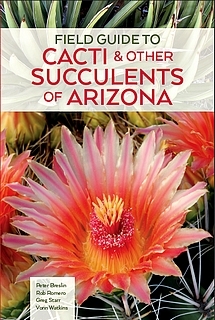 The Tucson Cactus and Succulent Society has recently published the TCSS Field Guide to Cacti & Other Succulents of Arizona. The TCSS Field Guide to Cactus & other Succulents of Arizona is the definitive source for plant identification in habitat. A much needed update of the current taxonomy, distribution and status of native Arizona cactus and succulents. All documentation and photography was provided by TCSS members who have traveled all over the state to capture and document these wonderful plants. 302 pages, 430 color pictures, 130 taxa covered (all the cacti in Arizona), 130 maps, laminated cover, stitched spine. Forward by David Yetman, illustrations by Margaret Pope. For all Cactus enthusiasts inside of Europe is this book at Kakteen-Haage now available. Click here to get a overview for that publication. The most beautiful pictures of the season 2012 at one glance in a slideshow now available. Click to enjoy the slideshow. Have many fun at viewing. Images from collections, botanical gardens, cactus nurseries and national parks. Clickable picture links, can be found here. Have a look at the highly respected Tucson Cactus and Succulent Society and their monthly Newsletter. Very interesting is the Cactus Rescue Crew. They harvest cacti and other native plants that otherwise would be destroyed during the development of the Arizona real estate. The saved plants are offered at Cactus Rescue Sale, where everybody is welcome! The translation of the English version is not finished yet. Some parts are available in English. The translation goes on. The work on the Encyclopedia is initially completed but will be continally corrected and updated. I wish all visitors an informative and pleasant stay and enjoy your visit! remove discard and diseased shoots and destroy diseased plants. Plants especially from dark-wintering areas and get cautious used to the intense light, shade, otherwise risk of burnings. Epiphyllum, Schlumbergera and Rhipsalis need shade. Give as much as possible fresh air to the cacti. The cacti begin again with drive (at the end of the dormant season), some also in flower, now give full warmth. Free the plants from of dirt by spraying at the end of the month. Note: the cactus body must be dried again until the evening. Fertilization of non-transplanted cacti is possible. Sowings continue. Make cuttings of mature shoots, leave them to dry the cut approximately 3 weeks before planting. Search thoroughly relocated plants particularly from the winter quarters for pests, preventive control of spider mites and aphids, especially in certain cacti species groups, e.g. Aporocactus, Chamaecereus, Echinocereus, Rebutia, Sulcorebutia, Aylostera.